Shepard speaks to the press at the September 2008 opening of his exhibition at White Walls Gallery in San Francisco. 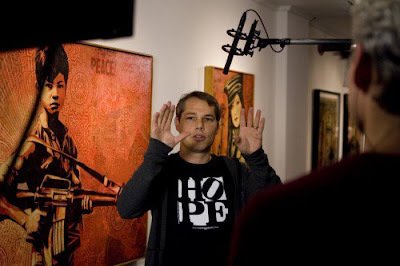 One of my favorite artists is Shepard Fairey, Obey Giant, who is the man behind the very cool Barack Obama red, white and blue "HOPE" image you may have seen as posters during the presidential campaign. 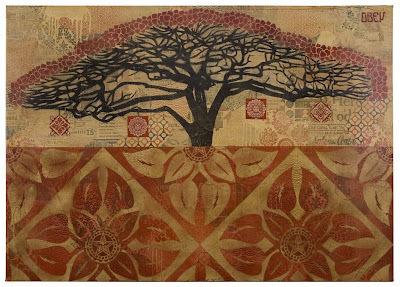 Anyhoo, Shepard had an exhibition at White Walls Gallery in San Francisco. WWG is owned and run by Justin Giarla and Andres Guerrero, two cool cats who have almost 30 years of experience in the urban art world. (www.whitewallssf.com) They are leaders in the world of bringing more respectability to street and graffiti art. I started documenting Shepard's "OBEY- Andre the Giant" face stencil art with my camera in New York City at least 14 years ago. At the time I had no idea who was doing it, but it stood out and I liked it. 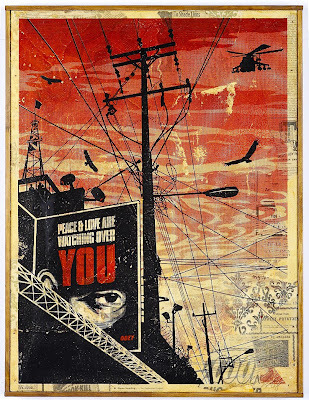 Now, Shepard is a rock star of urban art but has remained true to his roots. He sells his signed, limited edition art on his website for a normal, decent price of around a hundred bucks. They sell out in an hour. Shepard could raise his prices in a heartbeat and people would pay it. (His art shows also sell out.) 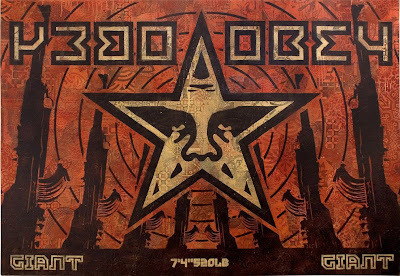 After a new print is released on his website, the next week, those same prints are being resold on ebay for three times or more their regular price. Shepard has expressed how much he dislikes this, but there really is not a lot he can do about it. (He does try NOT to sell to those people anymore, because he feels that the unscrupulous bastards are just in it for the quick buck). If you were lucky enough to have purchased a signed limited edition Barack Obama poster a year ago, well, last time I checked on ebay one was bid up to over $7,000, and over 60 people were fighting it out to be the winner! I have never met Shepard personally, but I plan to — someday.